It has been so great to learn with all of the people participating in this! I think you are right on target when you say that it is in the many small conversations we have about respecting different perspectives that this gets strengthened. It is important for students to see that we do not need to always agree, but that we can respect differing opinions, especially when they are shared within an existing relationship. Thanks for sharing your thoughts, Erika! Those small conversations really do lead us to bigger discussions. I so agree with what you (and Tony) have reminded us about slowing down and backtracking. And I highlighted the exact same quote from p. 71! I want the work students do outside the classroom to MATTER to them! This has been a FABULOUS #CyberPD that has pushed my thinking in so many ways! Thank you Thank you Thank you (one for each of the organizers) for leading us again this year! Thanks, Mary Lee! I'm excited to continue this conversation with you throughout the year! Yes!! I also feel like I am trying to cram so much into my summer learning to get ready for the new year! Thanks, Linda! It's really helping me to hear different people's perspectives during our book study. Laura much of what your write about makes me think once again about helping our students avoid the game of learning. Connecting what matters to students outside of school to what happens inside of school, expanding perspectives, and providing opportunities do engage in those things that matter most to our students is our work. On page 70, Judy Reppert reflects on how significant the Skyping interview experience was for all of the students and that it created a desire in her "to create more such experiences for the students and let them take ownership of what they were learning." This is the work then, to create more experiences, and it represents a shift in the way we prepare and plan our lessons. Such a challenge!! I'll be back later to comment on your post. Thank you so much for going down this crazy road yet again and hosting today's event. I will get all new posts connected to the Jog tomorrow sometime. Like you, I am considering this global piece. I've loved the changes in our learning community, but think I need to be better about this next step. One of the things I've been pondering is our blogs. I've kept our blogs locked down as it seems easier to quell concerns, but I'm very careful to teach students about safety. I can't help but wonder how they'd feel if they got a comment from another state, another country, or an author. I may need to rethink this. I think we'll have better access to Twitter next year so I'm hoping it will be easier to connect globally. Also, loved the piece you pulled out from the girl who questioned how she should use time for herself or her teacher. It's so important to know our students and their interests. This group has been amazing this year! Wow! A week between hasn't been enough time to digest it all. I've got lots more to think about. Thanks so much for hosting and sharing your thinking! Still need more time to ponder, read other posts, and reflect on how I can incorporate November's ideas in my classroom. Thanks for hosting and will return throughout the week! Amen to the low-key homework! I bet your families do appreciate that. My kids are on their own now, but family time is so crunched. I think we need to take a hard look at what we're asking kids and adults to do outside of the school day. I love that you found other first grade classrooms around the country and world through Twitter. What is the best way to do that? I use Twitter so much for my own learning - it would be great to start using it in the classroom this year. Any advice you have would be much appreciated! And last, I agree with your thoughts about not just using technology for technology sake. We do need to stay true to what we know about best practice and remember that technology is a tool. That will be baby steps for me! Thank you for hosting this week. Here is the link to my final post. I'm looking forward to sitting down and sharing in everyone's thinking! Here is the link to my post for Round 3! It looks like you and I were thinking a little bit along the same lines. Although, while I tend to spiral quickly out of control, you seem to know when to take a step back and slow down. I truly do believe that we all have wonderful ideas that are ready to implement and try but we will do our students a huge disservice if we go off spinning wildly with new ideas. We do need to circle back and remember the things we know and do that are good for students. Thanks for the reminder and thanks for being a great co-host. Thanks for hosting the third round this week...I appreciate how much effort you all put in to linking the blogs in a thoughtful way each week. Looking forward to hearing how all of this wraps for our group and seeing how your year progresses with your fourth graders! Thanks again for all you've done to organize this learning bonanza! It's been such a rich opportunity! Thank you for hosting #cyberPD this week, Laura. I agree with your thoughts about slowing down. I've spent time this week reflecting on what I can realistically implement in my classroom without overwhelming myself. Thank you for the reminder to slow down and stick with what we know works. Your statement, "this book has really helped me ponder where I need to go while holding on to what I believe to be true about teaching and learning" can be used to refer to many things going on in education right now. 1) Holy Rick Sutcliffe! 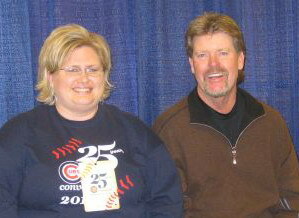 I am not a Cubs fan but meeting an all time favorite baseball player would be awesome. I'd probably go with Lou Whitaker since I am a Tigers guy, but I am not predicting that will happen. 2) Really weird and humbling to be reading my writing on this blog. Though I am thankful that my rambling struck a chord with at least one reader. 3) Thanks for sharing your thinking today. I enjoy reading your stories of how your first graders react to things and I imagine it will be the same once you start sharing what your fourth graders are doing. As a fellow fourth grade teacher who assigned very little homework, keep up that idea. I have found that students actually read much more at home when they have less busy work to do. And that is a great thing.